We’re all packed and ready to go to BarkWorld Expo in Atlanta today! BarkWorld Expo is a social media conference for the pet industry. This will be our first time there, so I’m super excited to see what it’s all about. It starts this evening — around the same time my flight leaves New Jersey. Unfortunately, Toby isn’t coming with me, mostly because I’m leaving directly from work in Manhattan and the logistics of getting him to the airport and such would have been messy. To say he was disappointed would be an understatement. Somehow they just know when you’re traveling or going somewhere, because last night he was being such a brat and doing everything he could to distract me from packing. On a sad note, this is likely the last conference like this we will be going to. While I’m the first one to stress how important networking is, traveling to these events is costly and I just can’t afford them anymore. Previous Post Mom, Why Can’t I Sit Here? Next Post Barksters Giveaway Winners! 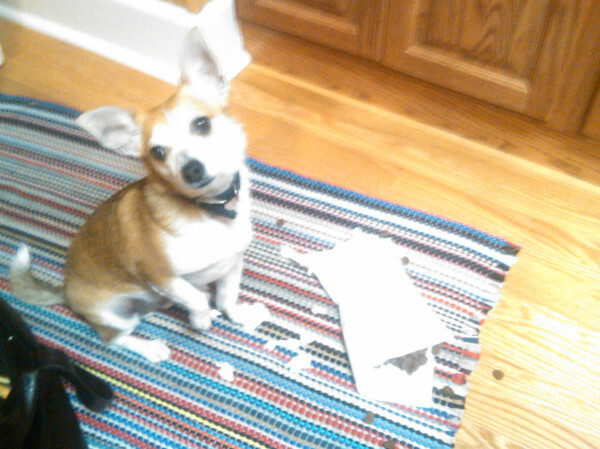 I'm just saying, where Toby's head is, and the white paper around him, he looks like he has the biggest ears ever. BTW never say "last" or "never" you could get a sponsorship or something, you don't know!